Of course it would be cruelty to even think of an operation for Bess3. I have just telephoned my doctor about it and he says that, so far as he knows, there has never been a recovery from operation, even in young people. But I do think it is too much for you to undertake to keep Bessie in the house. The last stage of that disease4, when in he the stomach, is sometimes long and painful. I know she is perfectly happy just now to be with you and see her friends. But as she grows worse [illegible]you must surely take her to Hastings5 to the Mary Lanning6. She would not dread that, so many of her country friends have gone there. It will be a case for nurses, as it grows worse, and there in the hospital the doctors will give her codine as the discomfort increases; that is the right thing to do in such cases. Of course Douglass7 and I will pay the expenses of her illness between us. I am enclosing a check to meet your immediate expense on her account. On June 22 I sent a check for $25.00 to William Andrews8. He cashed it on the 26th, and I hope the money was useful before Bessie left the place. Has Will Auld9 ever paid the interest on the money he 'borrowed' from Bess for Tom10? Why don't you ask Howard Foe11 to inquire into that? I simply don't like to see him get away with everything. 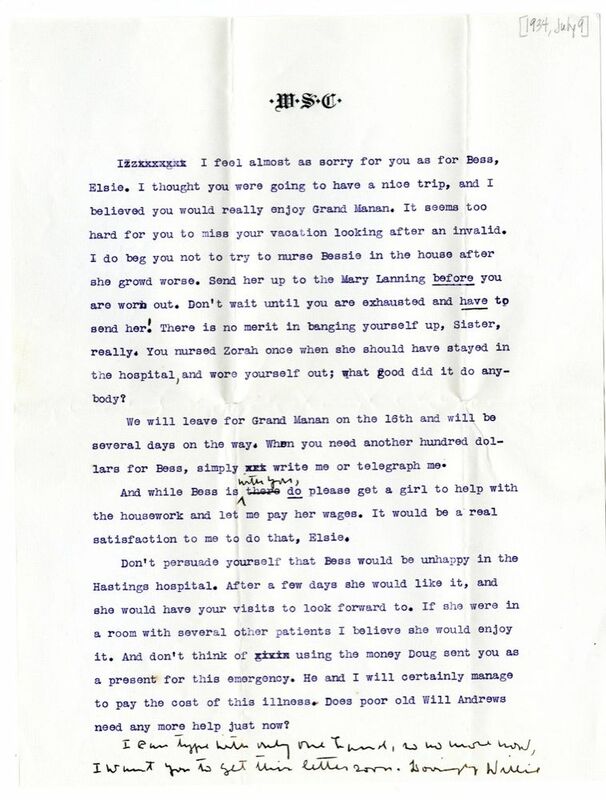 [illegible]I feel almost as sorry for you as for Bess, Elsie. I thought you were going to have a nice trip12, and I believed you would really enjoy Grand Manan13. It seems too hard for you to miss your vacation looking after an invalid. I do beg you not to try to nurse Bessie in the house after she growd worse. Send her up to the Mary Lanning before you are worn out. Don't wait until you are exhausted and have to send her.! There is no merit in banging yourself up, Sister, really. You nursed Zorah14 once when she should have stayed in the hospital, and wore youself out; what good did it do anybody? We15 will leave for Grand Manan on the 16th and will be several days on the way. When you need another hundred dollars for Bess, simply wri write me or telegraph me. And while Bess is with you, there do please get a girl to help with the housework and let me pay her wages. It would be a real satisfaction to me to do that, Elsie. 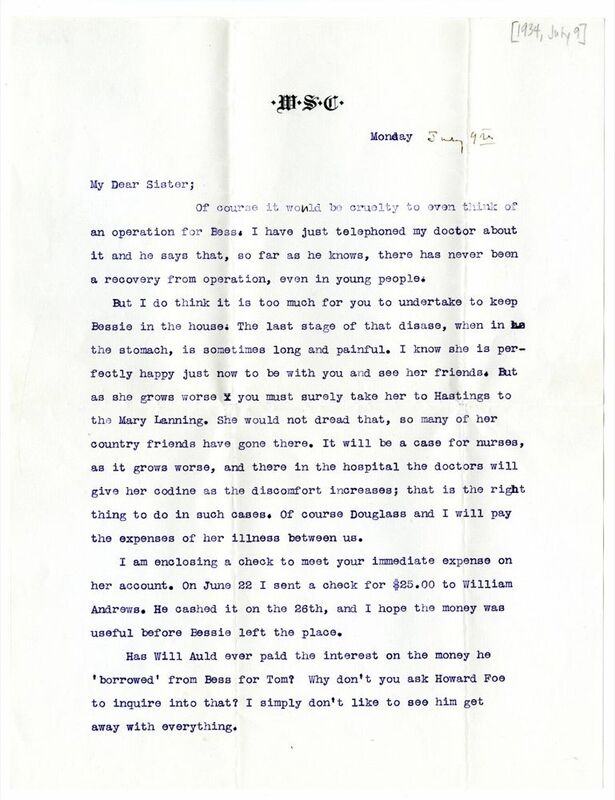 Don't persuade yourself that Bess would be unhappy in the Hastings hospital. After a few days she would like it, and she would have your visits to look forward to. If she were in a room with several other patients I believe she would enjoy it. And don't think of givin using the money Doug sent you as a present for this emergency. He and I will certainly manage to pay the cost of this illness. Does poor old Will Andrews need any more help just now? I can type with only one hand16, so no more now. I want you to get this letter soon. Bess Seymour was likely suffering from cancer. The Mary Lanning Hospital, founded in 1915. Elsie Cather was planning a "motor trip" through New England with a friend in the summer of 1934, and Cather encouraged her to also come to Grand Manan Island. In February 1934 Cather sprained a tendon in her left wrist while hanging a picture. It got inflamed, and she had to wear a splint throughout the winter and spring. Foe, Howard S. (1892-1960). Webster Count attorney. Born in Webster County, NE, Howard Foe was one of the five sons of Elizabeth and Samuel Foe; the elder Foe ran a billiard room in Red Cloud, NE. Howard Foe taught school to support his studies at the University of Nebraska law school, graduating in 1915. He became the Webster County attorney by 1920, later returning to private practice. 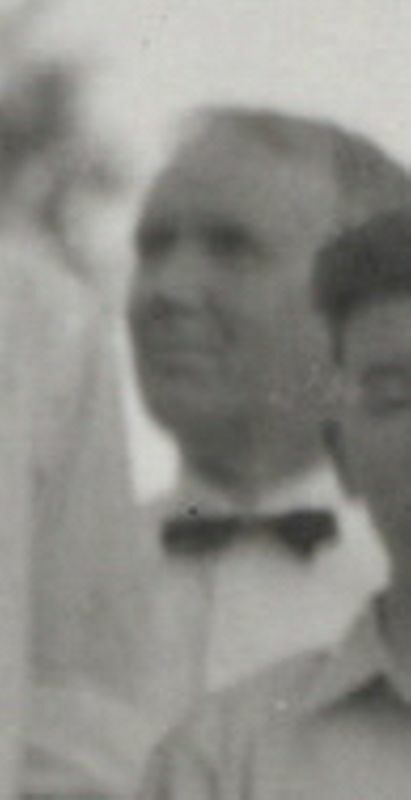 In 1919 he married Vernon M. Storey, with whom he had two sons. In the 1930s and 1940s he did legal work for Willa Cather related to Webster County farm mortgages she held.